A bundle of exciting, new slots and casino games are opening themselves up to UK casino players – with the provider Nolimit City entering the fray. As they’re a relatively small developer, there’s a good chance that Brits will be unfamiliar with their games – as they’ve not been available at any UK casino site before. However, Nolimit City being awarded a UKGC license in December 2018 has changed all that, so the Professor thought a thorough introduction was warranted. Founded in late 2013, Nolimit City had the unenviable task of tussling with the online casino industry’s biggest game providers. However, they arrived with plenty of experience within their ranks, quickly acquiring an MGA license so they could offer their creations to EU casinos. Fast forward to the end of 2018 and the studio has grown considerably to now boast a global presence – with operations in Sweden, Malta and India. By the time they were celebrating their 5th birthday, a total of 12 slots had been released. This may seem relatively modest considering their foundation date, but there’s much more to the developer than just games. That’s because they’ve used this time to build a complete gaming implementation platform, which includes a dedicated Promotional toolbox for quick offers and bonuses – which casinos can decide to use if they wish. So, the big news to take away is that the Nolimit City game library is set to double in 2019, working out at one new slot per month on average. But will they be a match for their current hits? One of the few advantages of a game studio releasing only a handful of titles is that you won’t be overwhelmed. When developers end up with hundreds and hundreds of slots, it’s very easy for you to neglect a large proportion due to not having the time to enjoy them all. However, with only a select number ready to spin, you don’t have to pick and choose. Instead, you can try all of Nolimit City’s slots without the threat of being worn out. Yet, for Brits who are just joining the party, here are the Professor’s top picks of Nolimit City slots to give you a starting point. Oktoberfest: A pretty self-explanatory slot, packaged with party, prost and bier spins just for the occasion. Germany’s most famous Volksfest reimagined for the reels! Tesla Jolt: Rather than being an Elon Musk/electric car tribute, Tesla Jolt takes us around the protagonist Nikola Tesla’s lab to see what inventions he has in store. Tesla Spins, Charged Wilds & Time-Lapse Triggers makeup the main attractions. Ice Ice Yeti: The last slot of 2018, Ice Ice Yeti, mixes it up with an expanding board and a different payout mechanic. Starting at 5×3 and 243 Ways to Win, the grid can grow up to 5×7 and 16,807 Ways to Win. Coincidentally, all of their slots have an RTP of somewhere between 96% – 96.99%. We’re not sure whether this is intentional or if one of the upcoming 12 releases will break this trend. Either way, it’s a pretty standard return-to-player percentage compared with other studios. 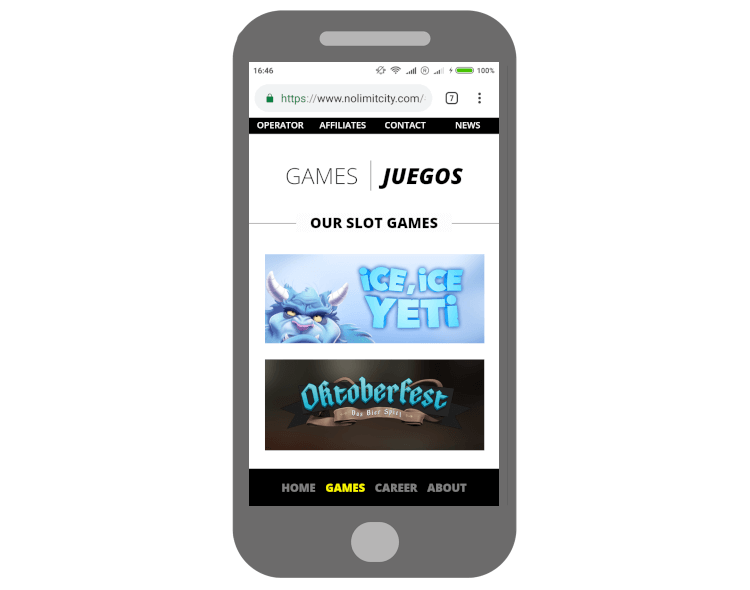 Of course, every single slot is also built using HTML5 technology – so they’re perfect for mobile casinos too. Nolimit City Games Coming Soon to UK Casinos! Although the UKGC license has been confirmed, the rollout of these games within UK casino sites is yet to take place. This is quite normal – as both the studio and casinos need a bit of time to implement the new systems – but Brits are expected to see Nolimit City slots at their top performers in the early stages of 2019.